**Run away to the Metropolitan Museum of Art with E. L. Konigsburg’s beloved classic and Newbery Medal­–winning novel From the Mixed-Up Files of Mrs. 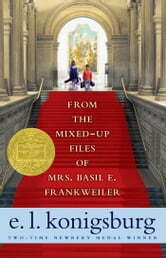 Basil E. Frankweiler—now available in a deluxe keepsake edition! You should trie this book!It was a great book!In the middle it trnd out to be a mystorie !!!!!!!!! !